Alex's creators hope to target the 12 million Britons who are not PC users. 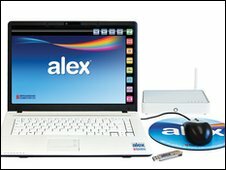 People confused and frustrated by computers can now turn to a laptop called Alex built just for them. Based on Linux, the laptop comes with simplified e-mail, web browsing, image editing and office software. Those who sign up for Alex pay £39.95 a month for telephone support, software updates and broadband access. Its creators hope the laptop and its simple suite of software proves to be a popular alternative to the Windows and Mac operating systems. "Alex is not designed as a super-computer," said Barney Morrison-Lyons, head of technology at The Broadband Computer Company which is behind Alex. "We're not buying into the current computer market." The idea behind Alex was to make using a computer a "simple and enjoyable" experience, said Andy Hudson, one of the founders of the company. Subscribers to Alex receive a USB stick which contains user-encrypted data and enables them to log on to their desktop from any Alex computer. For their monthly fee, customers also get anti-virus software and 10GB of storage space on the Broadband Computer Company's servers. Broadband is supplied by Southampton-based ISP Murphx. More than £2.5m has been invested in developing the product, the company claims. "We're the little guy, we know that," said co-founder Harry Drnec, who is credited with turning the energy drink company Red Bull into a profitable business in the UK. As well as communication tools such as e-mail, Alex comes loaded with a suite of open office software including applications compatible with Microsoft's Excel and PowerPoint file formats. The desktop is more comprehensive than that of Simplicity, a computer aimed at older people launched by TV presenter Valerie Singleton in 2009. Mr Hudson said the company also intends to launch an application store for Alex for customers who want to add more features and functions to their computer. "People who love Linux will be keen to develop for this," he said. The BBC's technology correspondent Rory Cellan-Jones said that Alex was an ambitious concept. "Alex is trying to do three things: win new people over to the internet, introduce a new - and more expensive - way of using computers, and take on the might of Microsoft," he said. "If the company succeeds it will be a huge boost for the cause of Linux computing."